Oven Cleaners Merton SW - Commercial & Domestic Kitchen | Quality Property Care Ltd.
You care about the quality and healthiness of the food you and your children eat? Keep your cooker or oven is clean. The nasty burnt on grime, grease and carbon residue on your oven can be harmful to the food you cook. 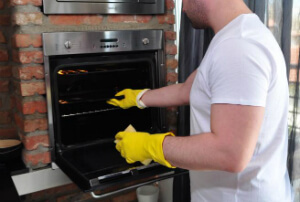 To make sure your oven is perfectly clean and safe, call Quality Property Care Ltd.. We provide efficient professional oven cleaning in Merton SW. Our residential and commercial oven cleaning service is recommended and preferred by a growing number of private customers as well as owners of professional kitchens. The professional oven cleaning company offers deep cleaning of all kinds of ovens, cookers, hobs, cooktops, microwaves, fridges, freezers, grills, extractors and other kitchen appliances at affordable oven cleaning prices. Call Quality Property Care Ltd. to receive your free quote within 2 hours. You can also send an online request form. Customer support is available, so go ahead! In addition to these, our reputable oven cleaning company Quality Property Care Ltd. is a real pro in sanitising of all these renown cooking device brands: Rayburn, Rangemaster, Smeg, Alpha Range, Stanley, AGA Range. In our team we hire only well-trained and educated oven cleaners Merton SW with finest skills and great approach to detailed cleaning. If you believe in healthy lifestyle and nutrition, you should never forget about the clean environment. It is more important than the origin of the products you cook. So don't leave your oven full of bacteria, greasy and dirty. Whatever it is, you can count on our first-class oven cleaning service. Don’t wait any more and ensure that your food is better and your oven will live and work efficiently and longer. Book the deep oven cleaning services of Quality Property Care Ltd. today! As an experienced cleaning expert that has been in the industry for many years, Quality Property Care Ltd. is a professional oven cleaning company that can take care of all types of ovens. We disassemble the ovens for more detailed disinfection. In the end, we re-assemble them for no extra charges. Submit an order for flawless oven cleaning in Merton SW. Make your dishes taste better. We will remove all the stubborn stains and burnt. We also eliminate the organic leftover residues and the sticky spots. Feel the difference in your shiny kitchen and enjoy your cooking with a freshened up and sanitised oven. It is cheap and easy now! Don`t give up healthy cooking and don't risk the life of people around you! Get the oven cleaning Merton SW deal now! Call us on 020 3746 4287 and get your free estimate or ask for additional information. Keep cooking tasty and healthy with Quality Property Care Ltd. and order professional oven cleaning service today!